I’m always looking for new ways to tweak and improve my skincare routine. I mean, aren’t we all? Especially after the winter we just had— the frigid temperatures really dried and dulled my skin. Lucky for me, I've been able to try out a new range of skincare out there that has helped. 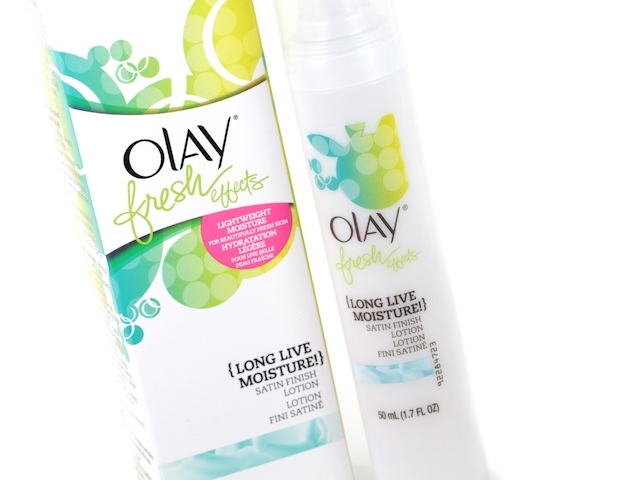 Enter Olay Fresh Effects— a new line of cleansers and moisturizers that will freshen up your skin and your mood. Cleansing is one of the best things you can do for your skin, amiright? Using gentle exfoliators accompanied with salicylic acid is up there, too. This new cream / gel cleanser is a combination of all those things. Now, it does contain exfoliating microbeads (so if you're not into physical exfoliators then this is not for you), but it’s still gentle enough to use in conjunction with my Clarisonic for an extra deep cleanse. Also, I haven't any problems with the microbeads getting stuck in my eye— I thought I would just put that out there since it's becoming a growing concern of mine with exfoliators. It comes in three different scents... I can only vouch for the Green Apple & Jasmine Tea one, though. I should also note that this cleanser is also sold as the Olay Pore Minimizing Cleanser + Scrub (says so on the back of the packaging). While makeup removing wipes aren’t for everyone, it’s hard to deny how handy they are for those lazy nights. I’ve tried my fair share of these, so I’ve developed a checklist in my head of what I like and what I don’t like. I like to use makeup removing wipes that remove face makeup well (doy), that feels gentle on the skin, that is not too saturated but not too dry, that doesn’t leave a sticky residue (or any residue, for that matter), and that smells nice. I don’t think that’s too much to ask, right? Well, this ticks all the boxes. I've tried two versions in the range— the Fresh Effects Everything off Makeup Removing Wipes and the Fresh Effects As Fresh as New Exfoliating Wipes— and I like both of them. I was a bit hesitant about the exfoliating one, but I’ve grown to love it. It’s pretty unique (at least I think it is). One side is a soft cloth and the other side is textured, which is actually really handy for exfoliating certain areas of your face. Personally, I love using it for the sides of my nose, my forehead and my lips. It’s a bit too abrasive to use on my entire face, but hey— that's what the other side is for. Nonetheless, the exfoliating side has been really useful. The regular makeup removing wipes are great for removing face makeup and also what little eye makeup I do wear. I haven’t really tested it with heavy duty eye makeup, because frankly… I can’t even remember the last time I wore eyeshadow. I love these wipes because they’re easy to use and they leave my skin feeling cleansed and fresh (not sticky or grimey). I suffer from dark under eye circles. I'm sure some part is genetic but I definitely don't help myself by sleeping too late and waking up too early. In the morning, my under eyes definitely need a boost and this gives my eyes an instant pick-me-up. Seriously. The tri-rollerball applicator feels so good on the skin! It’s cooling, refreshing and just the perk I need in the morning or throughout the day— yes... I've been known to take 30 seconds out of my day to massage my under eyes with this (especially after staring at a computer screen non-stop). The eye cream is nice and fairly hydrating, but I usually couple it with something more potent (like the Kiehl's Creamy Eye Treatment with Avocado or the Olay Regenerist Luminous Dark Circle Correcting HydraSwirl). The star of the show is definitely the applicator. Skincare (especially moisturizers) are a tricky business because everyone's skin is different (go figure, right? :). This gel moisturizer is great for my skin type (I have normal / combination, btw). It's lightweight, absorbs quickly into the skin, and it doesn't clog my pores. 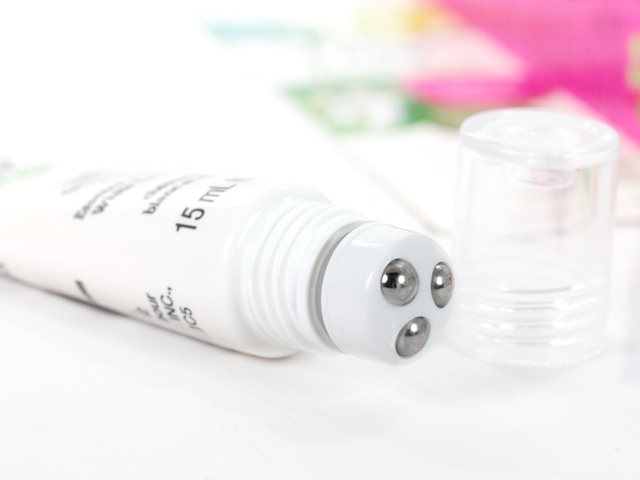 I'm not crazy about the jar packaging, I definitely prefer when skincare products come in a tube with a pump. There's also a strong scent with this product, but it does leave your skin smelling (and feeling) fresh. My favourite thing about this moisturizer is how it minimizes the shine on my forehead. It's bit pricey for a drugstore moisturizer but you only need a small amount to cover your entire face / neck. 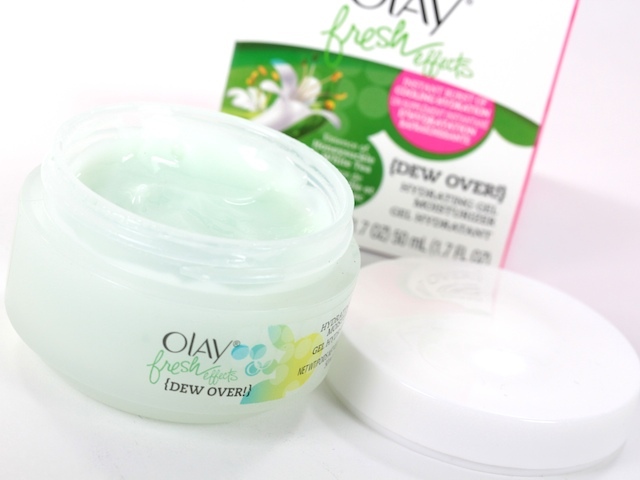 This moisturizer is also moisturizing on the skin (but still not effective for very dry skin). The lotion is lightweight and non-greasy, it keeps the dry spots on my face moisturized and the oily spots from becoming too shiny. Satin finish is a good way to describe this... it's not totally matte on the skin, but it doesn't make you look super shiny, either. I especially love using this at night, actually. When I wake up, my face still feels hydrated. The Fresh Effects line is available at all major retailers (Target, Walmart, Shoppers Drugmart, etc) and the prices range between $7.99 - $15.99 (depends on where you buy). Have you tried any of the products in the Fresh Effects line? Let me know what you think! It's easy to enter, just click on the rafflecopter widget below. The giveaway will end on June 22, 2014 and I will be contacting the winner via email (and announcing on Twitter // the blog). It's open worldwide, too. Good luck if you're entering! 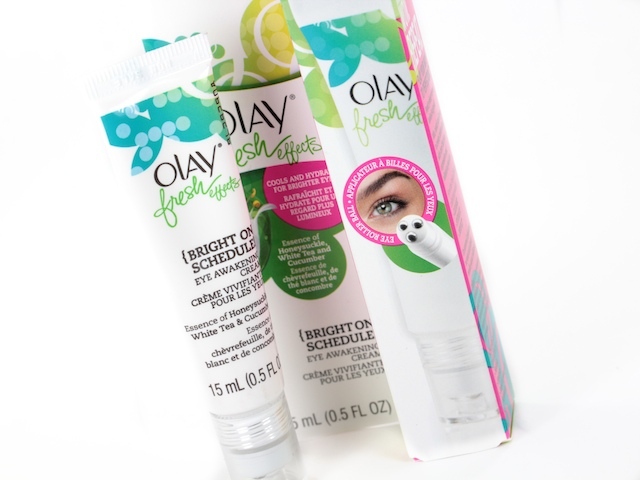 (*) The Olay Fresh Effects line was sent to Stylish & Literate for consideration. Read disclosure here. Facial cleanser is the last one I bought. I just purchased the Shiseido Benefiance Cleanser. So excited to finally try this out! tee-tree skincare kit from the body shop,just ordered yesterday for hubby actually. 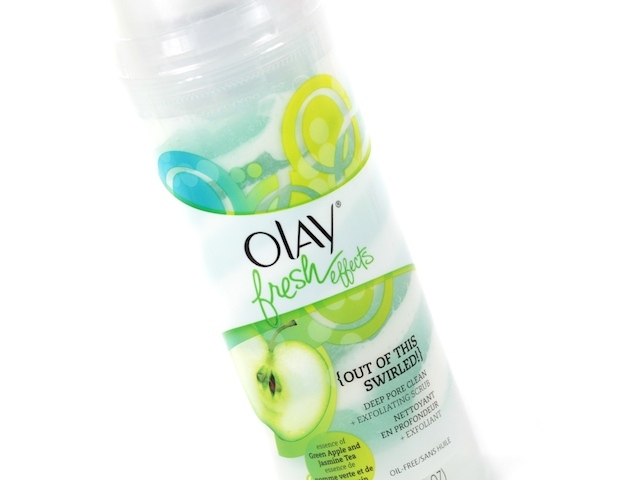 Olay daily face lotion unscented/sensitive skin. Please let me win. 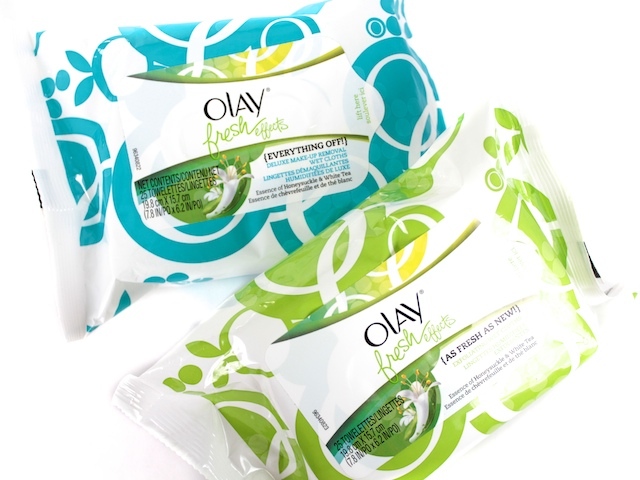 I'd love to try any Olay products! The last skincare product I bought was tea tree oil to use as a spot treatment for zits from the Body Shop. The latest skin care product I purchased was body butter from the Body Shop. The last thing I've bought skincare wise is rose hip oil! I just bought neutrogena naturals moisterizer. It smells so good, is not oily or thick and contains lots of different vitamins and minerals which are good for the skin. Last skincare I purchased SPF for my face. Gotta keep them wrinkles away! Neutrogena oil free moisturizer, stocking up on a sale! i love using vaseline as a lip balm! I use it as a makeup primer. Mix a little dab with moisturizer and apply directly to the face. It seals in the moisturizer and prevents make up from entering pores. It does make you a little shiny so make sure to use a good powder over foundation. I can't believe I actually WON!!! I never win anything!